Why WordPress Is Better For SEO Than Many Others? WordPress is an immensely popular web Content Management System that is used by millions of websites around the world! People never seem to stop asking the question: which is better, Blogger or WordPress? And indeed both have their pros and cons, making it almost impossible to declare a winner. But in today's ever-changing SEO environment, WordPress seems to offer a certain edge to users. I went over the latest statistics recently, and was staggered to find out that WordPress now powers 22.3% of all websites on the web! That's a CMS market share of about 60%! In comparison, Joomla powers 3.1% websites (8.3% CMS market share), Drupal powers 1.5% of the total websites (5.2% CMS share), and Google's Blogger comes in at 4th, powering 1.1% of all websites with a CMS market share of only 3%! WordPress is 20 times as popular as Blogger! Staggering, right? What makes WordPress so popular? Certainly, its power and flexibility can only be matched by Blogger's simplicity and ease-of-use. But what makes it so special is how much of an impact it can have on a site, not just from a development perspective, but also from a technical and SEO point of view. 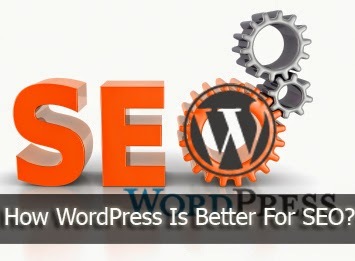 Here is why stock WordPress will win the SEO game over other stock CMS every time. Baby sites born on WordPress speak SEO right from the start! WordPress is very well coded, and makes new sites look very clean. Post URLs come with a SEO-optimized structure, which you can modify as well. WordPress has excellent taxonomy management, which allows you to categorize your posts according to categories as well as tags. Archive pages are handled by WordPress by default, some of which include the tag/category and author archives etc. The canonicalization is pretty sleek, and the default SEO settings disable indexing of these archive pages by default in order to avoid duplication. All in all, it's a pretty neat SEO solution right out of the box. It is ironic that WordPress, being so much more complex than the other CMS, offers such ease-of-use for beginners in SEO. WordPress often does a pretty good job on a site's SEO. But if you're looking for automation, or advanced features that you're comfortable messing around with, you can get some killer plugins that you don't otherwise get with CMS like Joomla or Drupal. Plugins such as 'WordPress SEO by Yoast', and 'All-in-One SEO' can add so much more to your site's SEO that you yourself ever could. From index settings to setting up structured data, these plugins can give you access to every inch of SEO you can possibly do on a website. Often times, you don't need all these advanced features, but it is nice to know you have the right tools in your toolkit. Templates, or themes as they're called in WordPress, add so much more to a site than just visual customization. The WordPress dashboard is pretty dynamic, and any add-on themes or plugins can change the look as well as the functionality of the dashboard. There are hundreds and thousands of free and premium themes available out there, many of them built on the best SEO foundations. You can find templates to fit any sort of website, from eCommerce to music sharing to personal portfolios. And you can rest assured that if a theme is popular, it must be well coded and conform to the latest SEO recommendations. There are extensive frameworks out there as well such as the Genesis and the Thesis frameworks, which extend the functionality of a website in terms of SEO, among other aspects. Genesis SEO settings do not necessitate the use of any third-party plugin, as their themes are highly SEO optimized and require little SEO knowledge to be handled. They act as an auto-pilot, taking care of the SEO stuff while you're running the show. WordPress is a very well-coded and highly optimized software that has taken years to reach perfection. Working in the dashboard, it might look like it'll take a lot of time to load a website, but it really doesn't. WordPress does a very good job at maintaining a reasonable load speed, since this is one criteria that has become crucial these days. What's more, you can use third-party plugins such as WP Super Cache to further reduce page load time, effectively giving you a better SEO score. And not to mention, you can find tons of professional all over the web when it comes to customization or troubleshooting. There are millions of WordPress websites, and millions of developers who're ready to provide free or premium services and resources. Your right Fun Mujja, this is really a nice info about Wordpress. We always give thanks to MBT for this. how to reduce blogger site loading time could you help me.. this is my blog. I am also using blogger. What are the benefits of moving to wordpress. Please clear. In wordpress "Install themes missing", so can't upload our own template or place our own domain and for that now we have to pay 99 USD every year. We created account on Wordpress.com and missing Install theme. So better to stay with Blogger. so there are many factors are there. End line is wordpress is much better then blogger. I am also a web developer and doing a job at German IT Solutions our many clients also use wordpress and they are very happy. Wordpress sites do load quickly and that influences their rankings. I agree with MBT ..
and i have configured that wordpress is better than Blogger. Website loading time is less. You can create XML site map in wordpress.